Her Majesty Queen Sirikit is Consort to a King who has been called upon to be the first reigning Monarch in the modern democratic era of Thailand. She is required and expected to display the traditional exceptional qualities of Thai Queens in adapting themselves in the best and most balanced manner to new conditions and situations. Queen Sirikit is the daughter of H.H. Prince Chandaburi Suranath and his consort Mom Luang Bua Kitiyakara, and was born on August 12, 1932, the auspicious year during which constitutional monarchy was introduced into Thailand. Her father was a Major-General in the Thai Army at that time, and later served as First Secretary at the Thai Legation in Washington D.C., then becoming Thai Minister to France and to Denmark and ultimately Ambassador to the Court of St. James. His young daughter accompanied him to his last 3 posts, and continued her education in the 3 countries and lastly in Switzerland. While her father was stationed in Paris, she first met His Majesty King Bhumibol Adulyadej, who was visiting Paris on a break from studying in Switzerland. The chance meeting ripened into friendship and understanding. When His Majesty met with a serious car accident in Geneva, resulting in a stay in a Lausanne hospital, Her Majesty was a frequent visitor. When His Majesty was well again, He was happy to arrange for Her Majesty to continue her studies at Riante Rive, a Lausanne boarding school. On July 19, 1949 Their Majesties quietly became engaged, and on March 24, 1950, They arrived in Bangkok by ship after a long absence. On April 28 of the same year, the Royal Wedding took place at Padumawan Palace. As a democratic King and Queen, Their Majesties signed their names in the Registry Book of Marriages. Prince Chandaburi Suranath also appended his signature to show that he consented to his underage daughter’s marriage. His Majesty then crowned his new wife Queen in conformity with Thai tradition. Their Majesties have four children, Princess Ubolratana, born on April 5, 1951, His Royal Highness Prince Maha Vajiralongkorn, born on July 28, 1952, Her Royal Highness Princess Maha Chakri Sirindhorn, born on April 2, 1955 and Her Royal Highness Princess Chulabhorn, born on July 4, 1957. Her Majesty has many public functions to perform. 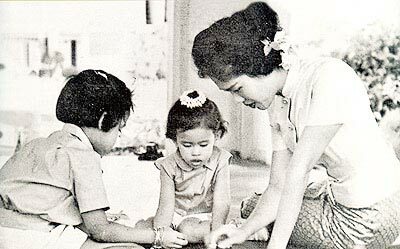 She became President of the Thai Red Cross Society on August 12, 1956, and Her enthusiasm for the work has built up Her popularity and aroused public support for the organisation. Towards the end of 1959, H.R.H. Prince Nagor Svarga, Executive Vice-President of the Thai Red Cross Society, died unexpectedly. Her Majesty ably carried on the Vice-Presidential duties as well as her own as President until a new Vice-President was appointed. In 1979, after the influx of 40,000 Cambodian refugees into Trat Province Her Majesty set up Khao Larn Thai Red Cross Centre to give shelter, food and medical care to the mostly peasant families with small children and unaccompanied orphans. The centre became a refuge for these displaced people for some years. 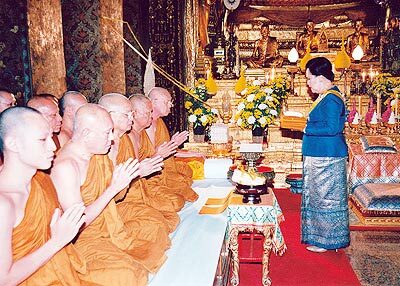 When His Majesty entered the monkhood in 1956, Her Majesty became Regent during that period, performing Her duties so well that, on a recommendation from the government, She was awarded the title of ‘Somdech Phraborom Rajininath’, a title given to a Queen who has ably performed as Head of State when the King is either absent from the realm or is unable to exercise his function for another reason. Since she was 18 years old, Queen Sirikit has encouraged the preservation of the environment and of Thailand’s art and culture and the values of Thai life. An example of this was her support of Pu Yen, a now-deceased citizen who lived by self-sufficiency throughout his 106 years on a boat in a river, asking nothing from anyone, and having no debts. When, very late in the old man’s life, his boat home was badly damaged by heavy rain, the Queen ensured that the damage was immediately repaired, thus demonstrating that the value of one well-lived life, often overlooked, should be appreciated. Her cultural promotion activities date back to 1960, when She accompanied His Majesty the King on a state visit to Europe and the United States. Noticing that there was no national dress for Thai women, she researched traditional costumes and adapted and modified the styles into 5 distinctive designs which proclaimed the wearer’s national identity. The introduction and promotion of Thai national costumes, so suited to hand-woven silk, has resulted in lasting benefits for manufacturers of the 4 types of Thai silk. Tie-died silk (mud-mee) is a speciality of North Eastern weavers; when Queen Sirikit became aware of a shortage of raw silk, she gave extensive support to the raising of local silk worms, suing her own funds to finance the project and buying up the products. Traditional patterns and designs have been revived and production techniques improved. In addition to her encouragement of traditional crafts across the kingdom, here in the North, HM the Queen has launched several hand-weaving projects, involving silk, brocade and thick cotton cloth, and promoted the indigenous embroidery of the hill tribe women, with which She is fascinated. She has, on several occasions, worn garments with hill-tribe embroidery in order that the tribespeople may feel proud of their traditional costumes and their craftsmanship. 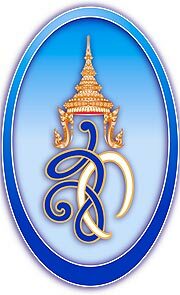 The Foundation for the Promotion of Supplementary Occupations and Related Techniques (SUPPORT) was founded in 1976 under Their Majesties’ Royal Patronage and Chairmanship, and provides outlets for local wares and handicrafts from all regions of the Kingdom. In 1979, the foundation launched the Chitralada Training Centre, which teaches Thai arts and crafts to children of landless villagers. At the present time, there are hundreds of thousands of needy families countrywide whose livelihoods have been much improved through the project. 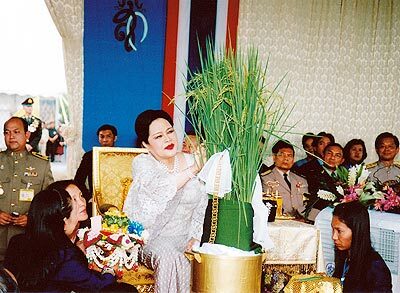 Queen Sirikit is committed to the conservation of natural resources and the environment, and has initiated Highland Agricultural Development Stations across Thailand as well as projects focused on reforestation, water resources, natural medicine and conservation, all of which enable her subjects to live in harmony with nature. Queen Sirikit is not only concerned with her human subjects, but also with the many species of animals in the kingdom. Earlier this year, after an elephant had been severely injured in an accident, she sent her expert veterinarians to ensure that the wounded pachyderm, much-loved symbol of Thailand itself, received the best of care. Nearly sixty years after Her Royal Wedding, Queen Sirikit continues to dedicate Herself to the welfare of her people. By her dedication, Her Majesty Queen Sirikit has blended Her role in the most effective manner possible to that of His Majesty. The Thai Monarchy is embellished and humanised by her feminine touch, becoming even more meaningful and more completely a personification of Thai nationhood. Ten Thai students at the New Life Foundation’s Chiang Dao village were recently overjoyed to receive scholarships of 5,000 baht each from the foundation. The youngsters are all students at the Chiang Dao Welfare School in the village and are all from either single parent or ‘caretaker’ families. 9 girls and 1 boy are being supported through the entire education process by the foundation, with girls being the priority as it is believed that when you educate a girl, you can change an entire family, and through this an entire community. Here in Thailand, there are many more opportunities for boys than for girls; a good education for female students is, therefore, essential. The scholarships, given for a period of 6 years, are not based as a reward for academic achievement , but are awarded as a means of support for the student’s family or caretakers, enabling the youngsters to continue with their education without being put under pressure to leave school and earn money. Most of the recipients are in their 5th year of scholarship support. The Chiang Dao Welfare School is now educating the third generation of New Life Foundation villagers, and also provides education with weekday boarding for over 760 hill tribe children. The scholarship fund itself was set up in 2001, with the proceeds from the 1st Western classical music concert given with the support of Payap University and the Chiang Mai community. 5 concerts in the ‘Chiang Mai Classics’ series have followed, all at Kad Suan Kaew’s theatre.